Victorian philosopher William James had a theory about emotion and behavior: It isn't that our feelings guide our actions (feel happy and you will laugh). On the contrary, it is our actions that guide our emotions (laugh and you will feel happy). This led James to a remarkable conclusion: "If you want a quality, act as if you already have it." 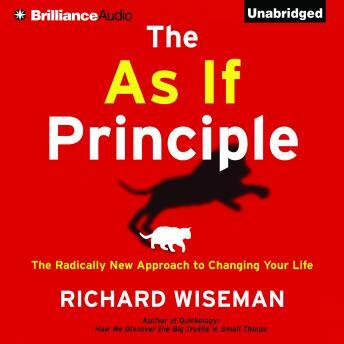 Roused by James's astonishing discovery, renowned psychologist and bestselling author Richard Wiseman confirms James's principle and shows how the self-help genre has for too long put the cart before the horse in trying to help us take control of our lives. Bringing to the table a dazzling array of firsthand experiments, surprising histories, and psychological case studies, Wiseman illustrates in brilliant detail how we can apply this principle in our daily lives: - Smile to become measurably happier - Wash your hands to drive away guilt - Clench your fist to increase your willpower - Eat with your nondominant hand to lose weight - Nod while speaking to become more persuasive - Act like a newlywed to rekindle your marriage Lively, engaging, and truly mind-changing, The As If Principle is that rare gem that offers real, workable solutions for your day-to-day goals while helping you to instantly take control of your emotions. Whether it's quitting a bad habit, persevering through a difficult task, or achieving your dream self, The As If Principle can help. Don't just think about changing your life. Do it.